Cradley is a very elegant modern typeface that has its roots deep in the Baroque era. 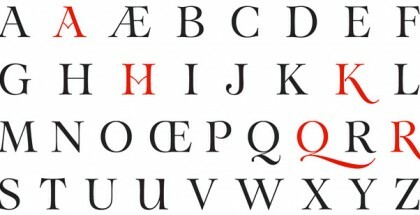 It was inspired particularly by the work of William Caslon I – a fundamental figure in the field of type design both in England and Europe. Born at the end of 17th century, Caslon became the most famous type designer of his time. His work gained instant popularity at such extent that even a famous quote came about, “When in doubt, use Caslon”. As a typical designer of the Baroque era, his highly distinctive typefaces bare all of its characteristics – great legibility, splendor, grandeur and exuberance. Of course, all of these could be found in Cradley too. 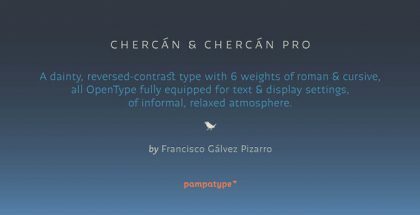 It will catch your attention immediately with its high contrast, perfect proportions and masterly crafted serifs. The sheer forms of this typeface make it perfect for a wide range of applications, especially when beauty is a must. Cradley typeface consists of three very carefully designed fonts – Title, Title Italic and Cradley Open. Each of them consists of more than 800 glyphs and additional extras like ligatures, contextual alternates, extra ligatures, dingbats & symbols and oldstyle numerals. Also, more than 30 beautiful ornaments or “flowers” as Caslon named them, are provided which are great for borders and accent. Cradley comes with very rich language support too for Central European, Baltic, Turkish, Romanian, Cyrillic and Modern Greek based languages. Cradley is designed by the US designer Jason Castle and is published by CastleType foundry – a very successful independent establishment that works with prominent clients like Chevron, Rolling Stone magazine, etc. Jason Castle has been interested in type design and calligraphy since his childhood years when he spent sufficient amount of time researching all examples, particularly from the Middle Age and Renaissance periods. Later he worked as a computer programmer before returning to his passion – digital type design. It is this great combination of interests and skills that makes his work so professional and successful. Get Cradley and enjoy a bit of splendor in your work!